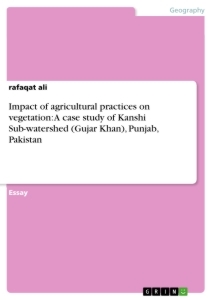 Impact of agricultural practices on vegetation: A case study of Kanshi sub-watershed (Gujar Khan), Punjab, Pakistan. Increasing population needs increased amount of food stuff as well for the survival resulting in the conversion of bare and forest land into agricultural lands for maximum productivity. During last few decades the population of Pakistan is increasing tremendously and the lands are being converted into agricultural lands. The major point of concern is the impact of these lands on watershed area which not only contributes water into the Mangla dam but also the sedimentation problems are observed. This study focuses on the impact of agriculture on the study area. 70% of the total population is associated with agriculture for livelihood among which mostly farmers are uneducated. Most of the lands which were covered with forest and wild trees are now converted into agricultural lands and soil erosion problems are increased. Satellite images of different resolutions were obtained from World Wildlife Fund for nature-Lahore and private organization “JERS” Lahore. Population and agricultural data was obtained from census report 1998, questionnaire and interviews from local community. By this data, vegetation cover of 1992 and 2000 was extracted as well as present landuse classification is done using ArcGIS software and it is observed that the vegetation cover is decreased drastically due to deforestation for agriculture during last few decades. Increasing population demands for increased amount of food and fiber. For this reason the bare lands and forest lands are being converted into agricultural lands which are not only decreasing the forest area but also contributing to the increased soil erosion problems which in turn become the major cause of sedimentation in respective dams and flash floods especially in highlands. Excessive use of fertilizers agricultural practices are also the source of infertile souls due to top soil loss by erosion. Forest cover cleared for agriculture and agricultural lands converted into housing societies is a point of concern for policy makers and environmentalists because this phenomenon is altering the natural environment and promoting accelerated natural hazards like floods, droughts, erosion and uncertain rainfall events. This study was conducted to identify the agricultural impacts on vegetation cover. Opportunities and constraints for new land uses are created by local as well as national markets and policies. Global forces become the main determinants of land-use change, as they amplify or attenuate local factors(Lambin, Turner et al. 2001). - Identify the role of agriculture in altering the vegetation condition and find out possible direct or indirect impacts of agriculture on vegetation cover. - Map the landuse of the study area showing the different type of landuses. The study area consists of tehsil Gujar Khan of Rawalpindi district which is included in potohar region of Pakistan. The coordinates of the study area are 33°20’57.91” N, 73°19’33.06” E, 33°20’18.16” N, 73°27’18.63” E, 33°14’39.04” N, 73°17’53.36” E and 33°12’24.37” N, 73°25’58.11” E and Kanshi watershed is sub-watershed of Mangla watershed which is situated in tehsil Gujar Khan and tehsil Kahuta of Rawalpindi district. “Har”, “Kurri”,“ Missa”, “Guliana” “Phahna” and “Gulin” are sub-streams of Kanshi which after joining Kanshi drain into the Jhelum River at 33°14'54.59"N Latitude and 73°36'24.21"E longitude. Satellites images (of Landsat TM 30x30 meter resolution) of 1992 and 2000 were obtained from World Wide Fund for Nature (WWF), Lahore, Pakistan for change detection in vegetation cover and analyzed using Erdas imagine 9.1 and Arc GIS 9.2.Satellite image of 10 x10 meter resolutions were obtained from a private organization “Jerse” to find out the present landuse and its classification was done after carefully digitizing the image in Arc GIS 9.2.. Topographic sheets of Rawalpindi and Azad Jammu & Kashmir were used to delineate Kanshi watershed. Two weeks field visit was arranged to gain the first hand knowledge of the field and before going to field visit, a questionnaire was prepared by keeping in mind the possible issues which came out after literature review and data acquisition. Questionnaire and interview data were used to identify the socio-economic condition of locals. Graph prepared from questionnaire and landuse classification map clearly indicates that the most of the population of the study area is associated with the profession of agriculture and mostly the land is converted into agricultural lands. The setallite images (Landsat TM, 30x30meter resolution) of 1992 and 2000 show that the overall change from 1992 to 2000 is termendous. The vegeataion cover is almost vanished from some of the city areas or minimized upto dangerous level. By now the vegetation is only remained near water bodies. Agricultural practices are increased and land is cleared for farming during last two decades. The change in vegetation cover resulted in soil erosion and increased sediment ratio into Mangla reservoiur. Land is most important of all the natural resources and unique, being the mother of all resources. A healthy watershed needs a healthy environment and a healthy environment needs a healthy land so, the landuses of any area generally and of watershed area specifically should be managed & planned. More and more land is being converted into agricultural land which causes severe soil erosion problems as the topography of the study area is not stable. As a result of population growth, settlements are increasing fast hence; the agricultural land is being converted into settlements and bare land to agriculture. Soil degradation and water contamination is important issue because of increasing brick business, agriculture, settlement and lack of vegetation cover. The waste water of the whole area is drained into nearby channels, contaminating the water quality. Forest clearing and lack of institutional involvement for betterment of environment is causing severe environmental issues like uncertain rainfalls or temporary drought conditions. These conditions have significantly affected the discharge of Kanshi River. Anthropogenic activities are disturbing the natural eco-system and accelerating the hazards expected by climate change. J. Six, E. T. E., K. Paustian ( 2000). "Soil macroaggregate turnover and microaggregate formation: a mechanism for C sequestration under no-tillage agriculture." Soil Biology & Biochemistry 2100-2103. Lambin, E. F., B. L. Turner, et al. (2001). "The causes of land-use and land-cover change: moving beyond the myths." Global Environmental Change 11(4): 261-269. Borma, L. S., C. A. Nobre, et al. (2013). 2.15 - Response of the Amazon Tropical Forests to Deforestation, Climate, and Extremes, and the Occurrence of Drought and Fire. Climate Vulnerability. R. A. Pielke. Oxford, Academic Press: 153-163. Ghazoul, J. (2013). Deforestation and Land Clearing. Encyclopedia of Biodiversity (Second Edition). S. A. Levin. Waltham, Academic Press: 447-456. Jankauskas, B. (2000). "MODELLING OF TERRESTRIAL EROSION AND CHANGE OF SOIL FEATURES UNDER SOIL EROSION ON THE HILLY RELIEF OF LITHUANIA." International Archives of Photogrammetry and Remote Sensing. . XXXIII, Part B7: 615-622. M. HANIF, F. S. (1990). "Watershed restoration reduces runoff and sedimentation from comparative watersheds in Pakistan's subtropical scrub zone ": 374-382. Dr. Izhar-ul-Haq, S. T. A. "Pakistan Engineering Congress, 70th Annual Session Proceedings ": 24-45.